It’s been more than sixteen years since The Iron Giant saw the inside of a movie theater. Since then director Brad Bird has gone on to do amazing things and Vin Diesel, the voice behind the titular character, has become one of the biggest action stars on the planet. But for those who missed their chance to see this cinematic masterpiece on the big screen, fret no more. 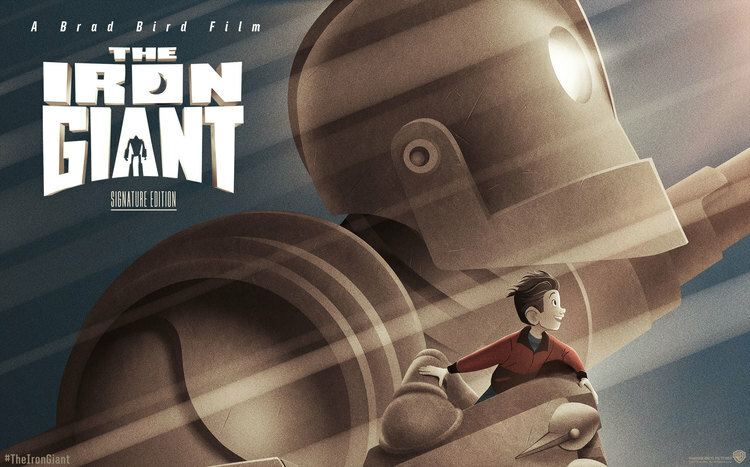 Fathom Events and Warner Bros will be bringing back The Iron Giant for an extremely limited engagement this fall. The film will screen Wednesday, September 30th at 7:00PM with an encore showing on Sunday October 4 at 12:00PM in select markets. The newly named The Iron Giant: Signature Edition will have two new scenes added in and will be available for purchase through digital retailers shortly thereafter in high-definition. And while no hard street date was given, for those of us who like physical media, the film is said to be making it’s blu-ray debut sometime soon. I for one will not be missing out on seeing this on the big screen. I’ve also been waiting for a Blu-ray of The Iron Giant for quite some time now. With the timing of this I wouldn’t be surprised if we see the Blu hit stores before the end of the holiday season. When “The Iron Giant” arrived in theaters in 1999, it was hailed as an “instant classic” by Joe Morgenstern of The Wall Street Journal, and the world soon learned another giant had arrived as well: filmmaker Brad Bird, who made his stunning directorial debut with this film and has gone on to win two Oscars, as well as worldwide acclaim for his work on both animated and live-action features. Winner of nine Annie Awards, “The Iron Giant” is being re-mastered and enhanced with two all-new scenes. In the small town of Rockwell, Maine, Annie Hughes (voice of Jennifer Aniston) is just worried about putting supper on the table for herself and her nine-year-old son, Hogarth (voice of Eli Marienthal). A single mother holding down a job at the local diner, Annie has her hands full with Hogarth—headstrong and imaginative, always on the lookout for the latest attempted takeover by mutant aliens or subversive invaders. But it isn’t long before the rumors turn into paranoia—the situation escalates and the possible destruction of Rockwell looms. Hogarth turns to his friend, the Iron Giant, who ultimately finds its humanity by unselfishly saving the town’s residents from their own fears and prejudices. Warner Bros. presents “The Iron Giant: Signature Edition,” a full-length animated motion picture directed by Brad Bird. Produced by Allison Abbate and Des McAnuff, the screen story is by Brad Bird and the screenplay is by Tim McCanlies, based on the book The Iron Man, by British Poet Laureate Ted Hughes. It was executive produced by Pete Townshend and the music is by Michael Kamen. The film also stars the voices of James Gammon (as Marv Loach / Floyd Turbeaux), Cloris Leachman (as Mrs. Tensedge), John Mahoney (as General Rogard) and M. Emmet Walsh (as Earl Stutz). “The Iron Giant: Signature Edition” is distributed by Warner Bros. This entry was posted in Blu Ray, Breaking News, Film and tagged Iron Giant. Bookmark the permalink. So far, it only appears to be a US release. Finger’s crossed it hops across the pond though!